Now and Then – Sherry Bombs. Slightly back to front, I’m going to start with the results before we get into some more detail. We recently blindly assessed some of the worlds largest and most influential single malt brands… Can their current entry level bottles keep up with discontinued past versions? MACALLAN, GLENFARCLAS, BALVENIE, GLENDRONACH, HIGHLAND PARK and ABERLOUR… Take the stage! The second ‘Now and Then’ was once again hosted by the whisky guru and raconteur Mr Charlie MacLean. For those unfamiliar with the Now and Then club, we meet now and then, and we compare/contrast whisky from now and then. Bacon sarnies, coffee and great conversations kicked us off in high spirits and we were delighted to welcome Gavin Smith to his first session – The full quintet was together for the first time. Sherry bomb sampling of 6 highly respected distilleries was the tough ask of the day. We chose the above distilleries for their strong sherry bias, past and/or present. All are strong brands with a pedigree of unquestionable quality…. But that was then and this is now! 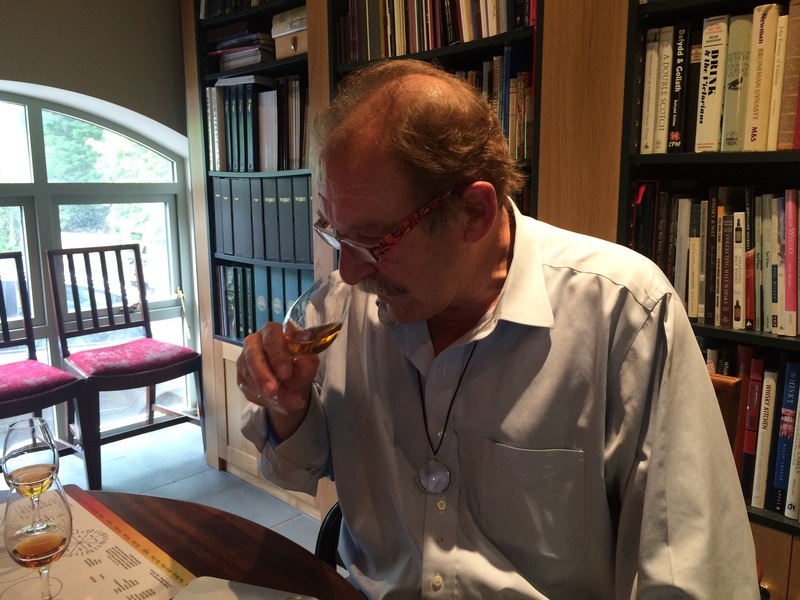 Before some in-depth analysis of the scores we pose the hypothesis – OLDER BOTTLINGS ARE BETTER! AGE: Is the average age of whisky in the old bottles higher than the contemporary bottlings? Stock management is tricky when demand is outstripping supply. In days of yore (the 1970s, 80s and 90s) there was maybe a little less pressure on stocks and a master distiller or whisky maker could be a bit more flexible with the casks he/she selected for vatting, marrying and bottling. I can clearly recall at Macallan we had large stocks of whisky from 1979 and 1980 which allowed our 10 and 12 year old whiskies, in the early to mid-1990s, to have the inclusion of older liquid. In percentage terms the amount of older whisky added was small but it none the less increased maturity, quality and richness. It allowed me to balance out any younger, rougher, less mature stock even though that whisky was technically of the right age. When Macallan was acquired by Highland Distillers in summer 1996 we began to look at the average age of all Macallan bottlings and compare them with Highland Park…..and guess what we found! The HP 12 was an average age of 16.7 years and Macallan 12 was around 12.5 to 13 years of age. No wonder HP 12 was winning so many awards back then. The folks at HP had it easy. I would have loved to make the Macallan 12 with spirit of an average (so there was some really old stuff going in!) age of 16.7 years old! WOOD: More sherry influence in the old bottles and less in new releases? Have the casks changed? Has the process of “designing” the wood and setting in place acorn to cask supply chains reduced the quality of the wood? Is the wine/sherry seasoning delivering what is required? If I were heading up some of these large brand owning companies today I would worry much less about distillery efficiencies of mashing, fermentation and distillation (which has been done to death over recent decades and continues to lead to operational efficiency creep and spirit standardisation) and focus more, much more, on the “right first time” wood supply efficiency and effectiveness. It seems to me to be crazy that production managers are held to account for minor efficiency enhancements but the same is not done to those employees sourcing the wood. Research continues to suggest that the wood can contribute around 80 % of a mature whiskies character – I bet not even 8% of a companies operations research budget goes in to wood supply chain improvements! The key here is the wood extractive potential and for European oak sherry casks you need lots of tannin potential to drive spices in to the spirit, sherry to add dried fruit flavours and then time and oxidation to shape, transform and mellow the whisky and add fragrance, orange and oak notes. Of course, if we did an American white oak tasting we would be looking for vanillin and lactone extractives – caramel, toffee, crème brule, vanilla, fresh fruits and lemon citrus notes. PROCESS: Barley varieties, slower malting, gentler mashing, more complex fermentation, direct fired stills and different cut points? All factors which to a greater or lesser degree change a new-make’s character. We know this but believe age and wood will have far more of a contributory influence. BOTTLE AGEING: How does the spirit change in the glass over time? Chemically speaking, it must. Does significant bottle ageing change a spirit for the better, softening, rounding out and harmonising flavours? We believe it does. All simple hypotheses (and opinion); none of which would be easy to prove one way or the other. But what did the results say? As with our first session all about old vs new blends, this isn’t going to be a traditional write up of tasting notes, it’s going to be a little more focussed on the stats. Single Malts are en-vogue. Auctions continue to gather pace and achieved prices remain very bullish. So, time to see what all the fuss is about with old, sherry cask matured whiskies from some of the most sought after distillers. 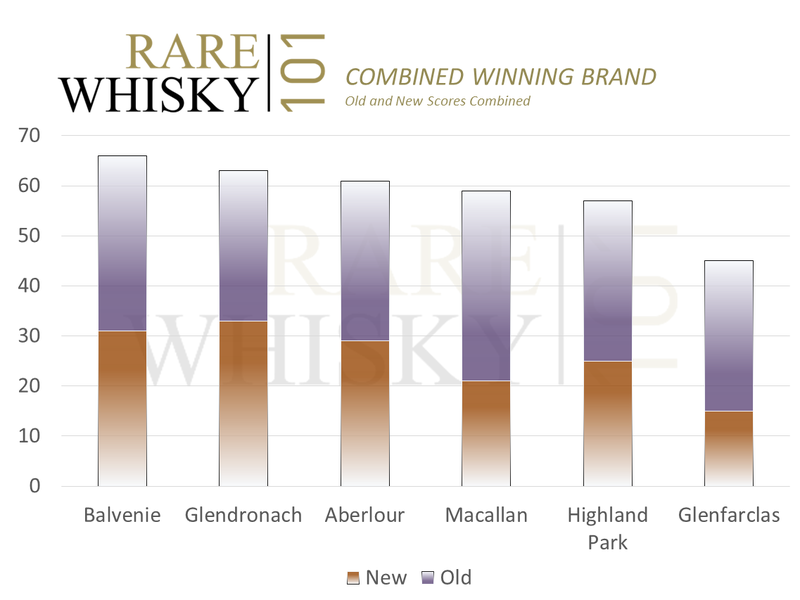 The top 3 whiskies were Macallan 10 (old), Balvenie 10 (old) and Glendronach 12 (new). So what can we learn from this? Many of our clients and ‘the noise in the pipes’ we hear, suggests Macallan is losing its sherry style and that Glendronach is the new sherry bomb on the block. Our results certaintly agree with that. Macallan old greatly outscores Macallan new 38 points to 21. Glendronach new outscores its own old by 33 to 30 and is the only instance where the new whisky was rated more highly that its older twin – well done Billy Walker and team for the continued focus on high quality sherry wood! Turning to Balvenie we see old scored 35 to new of 31 – both delicious whiskies. 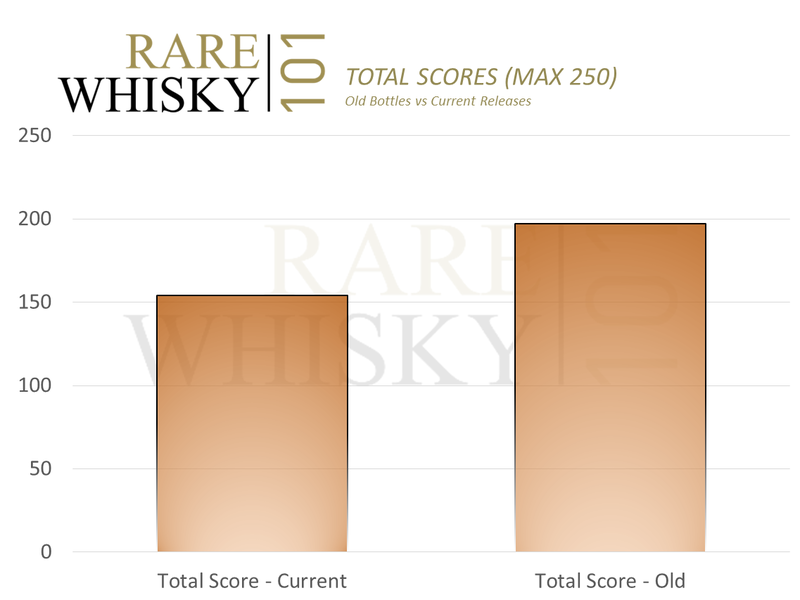 Interestingly Balvenie’s combined old and new scores were the highest at 66 points, just shading Glendronach’s total at 63. 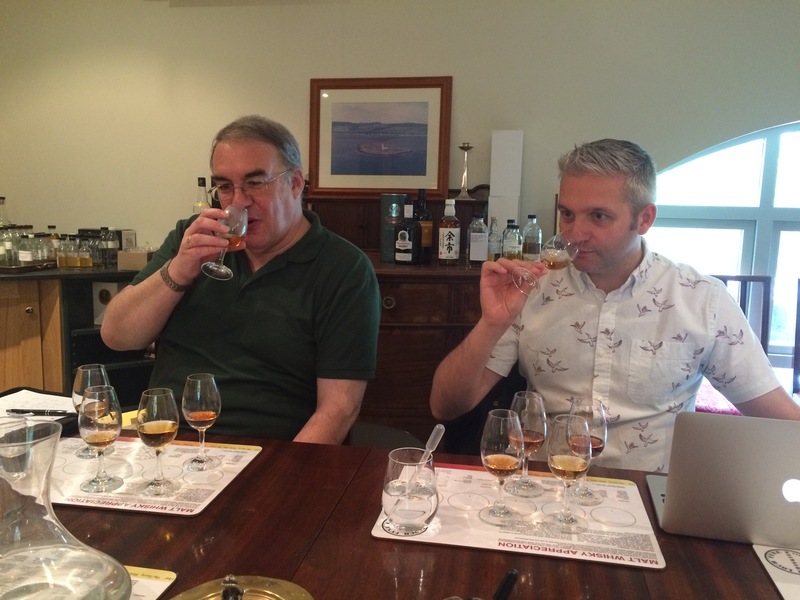 Apart from Glendronach, the panel preferred the older variants from the other 5 distillers. Is this proof that older bottlings are better than their younger twins of today…we say yes, but it depends on the brand. 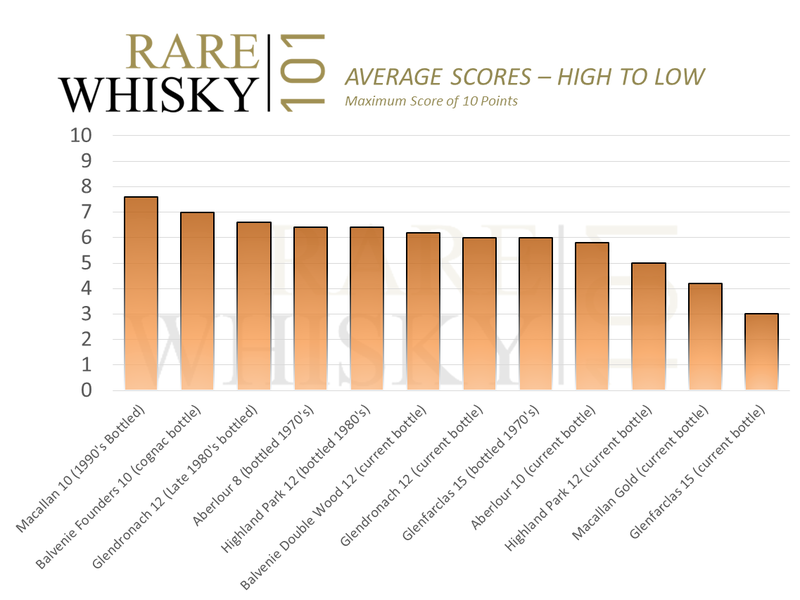 Macallan shows the greatest difference in score followed by Glenfarclas and then Highland Park. Aberlour and Balvenie are pretty close with the old variants being slightly preferred overall by the panel. 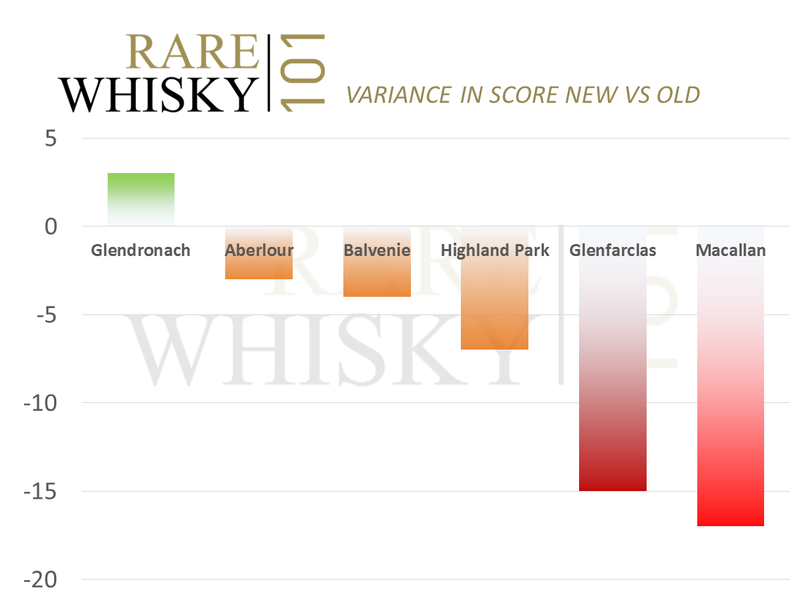 Glendronach bucks the trend, with the new variant outscoring the old variant by 3 points. Positives & Negatives – We had to at least do some tasting notes! When both old and new are combined we get a view of brand quality. 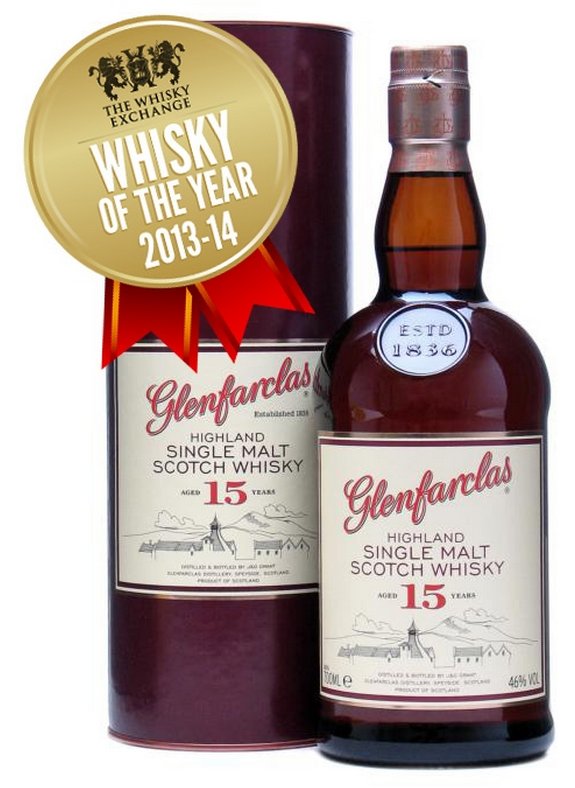 It was thought that Glenfarclas with its 15 yo entry would score highest and have the advantage of age. That was not the case, the new 15 yo GF was the lowest scoring whisky with only 15 points – an average per taster of 3 points! WOW, this is serious. Especially as The Whisky Exchange has this bottling as one of its favourites. We can only assume batch variation is the culprit here. Has the mighty independent force of will from the Grant family maybe not got as many brilliant sherry casks as had been thought! Highland Park was second last with a total of 59 points, only 2 behind Macallan – are Edrington struggling to keep pace with demand and is quality of wood purchase and thus bottlings suffering? Do they need to get Billy Walker to source their sherry casks? The other three distillers all scored in excess of 60 points. 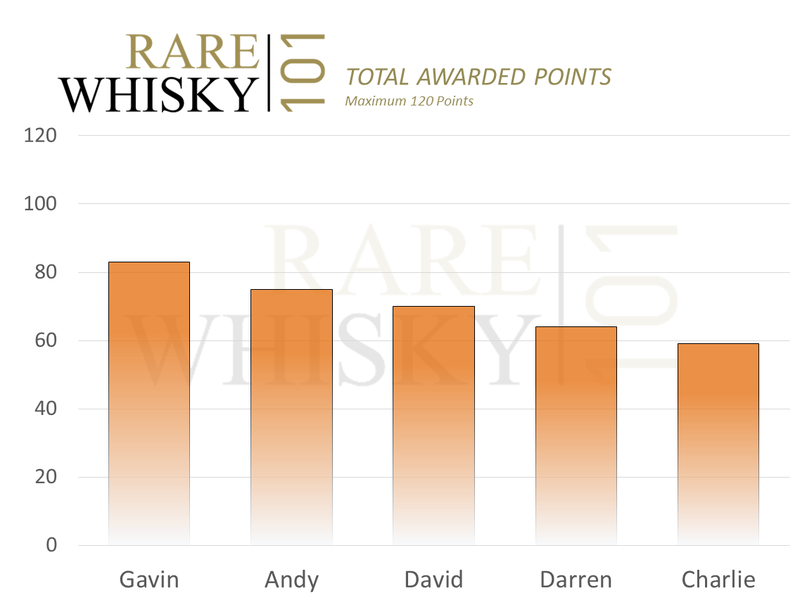 Gavin was the most generous awarding a total of 83 marks and was the most easy to please and found 5 whiskies worthy of 8 points, averaging 6.92 points per sample. Charlie had the nose that seemed least excited and only awarded 59 points across all the samples, averaging 4.92 points per whisky with a spread of 8 to 2 points. Darren, Andy and I awarded 64, 75 and 70 points respectively and were close to the average. So, which whiskies did each panel member want to take home! 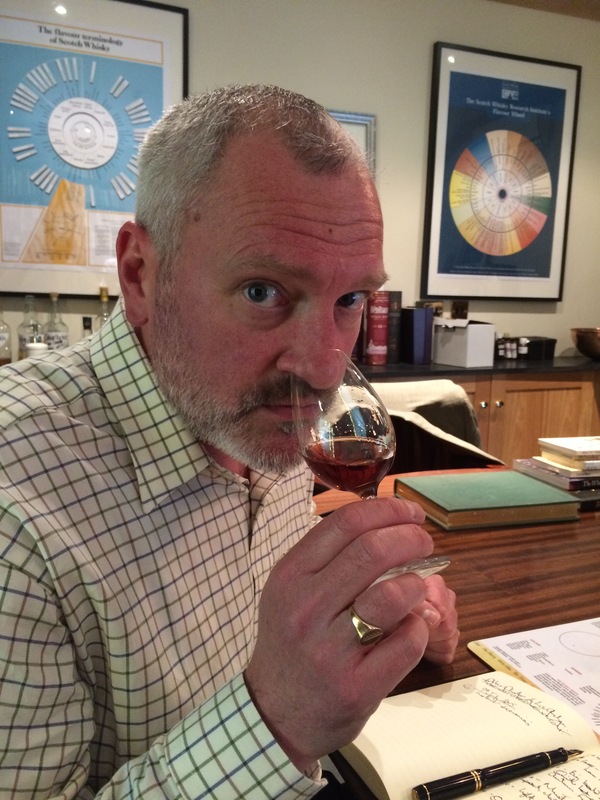 Gav loved Old Mac, Old Glendronach, New Glendronach, Balvenie New and Aberlour Old – scoring them all 8/10. Darren was a bit more discriminating, awarding 8/10 just once and lusted after the new Glendronach. Charlie, tough (as old boots) and hard to impress, liked the old Balvenie and gifted it 8/10. Andy with a 9/10 demanded the old Aberlour. I thought 2 whiskies worthy of the magic full marks of 10 – Macallan old and Balvenie old – maybe my nose can still recognise that delicious old sherry style after all and I fondly recall working as a car park attendant at Glenfiddich/Balvenie in summer 1986 and the access I got to the old founders reserve. The lowest scores were given by Gav, Darren, Charlie and Andy to the new Glenfarclas 15 with 5, 2, 2 and 2 points respectively. I was the outlier, scoring the current Glenfarclas 4/10 but I found the old Glendronach a little less pleasing and scored it 3/10. Apart from Glendronach the findings here echo what we saw in our blends assessment. Maybe Billy Walker should be made COO for Sherry Wood supplies to the industry – he seems to be getting it right more than some of the much, much bigger guys! So what? Where can you go to get these great old variants? Auctions is one key place and we have found that prices for these old bottlings range from £60 to £120. Interestingly, the new variants range in price from £25 to £45. The Aberlour 10 year old looks to be best bang-for-buck and is frequently discounted to around £20 per bottle. Next time we’re together we move onto the Islands. I can bat the ball back to Andy and set him the challenge of an Islay Now and Then. And after that, we will look to do some ex bourbon matured malts – with some of The Glens – Morangie, Livet, Fiddich, Grant, Rothes. The difference between old and new bottlings of the blends was significantly more heavily weighted towards the older variant. With malts, it seems the scores are somewhat closer. The new blends achieved just 58% of the score of the old versions where the new malts achieved 78%… the quality of blends looks to have slipped more than malts… or do blends continue to ‘marry’ in the bottle far more than malts? As the ex-Master Distiller from the (past?) 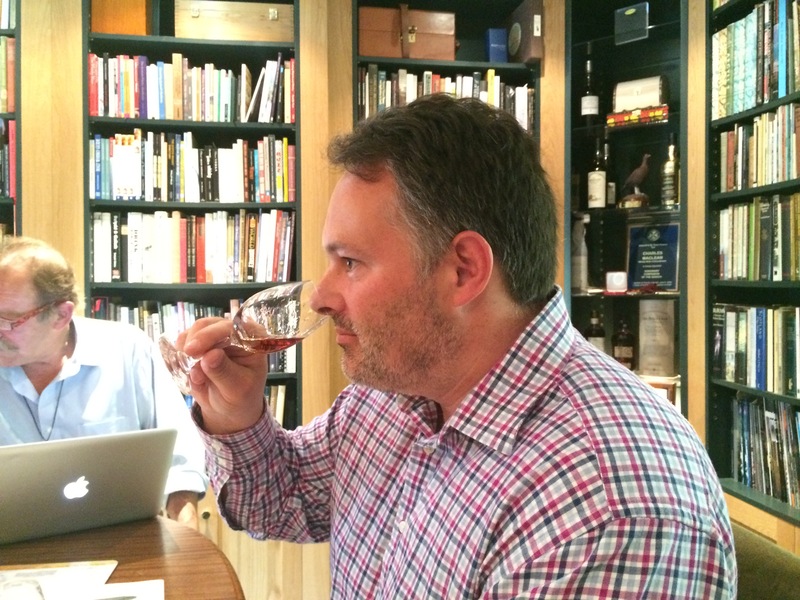 king of sherry, The Macallan, it has been a fascinating tasting and report to compile! Please email in your comments and questions. We’d love to hear your thoughts. Don’t believe everything that’s written. This advert from The Whisky Corporation in Hong Kong crossed my desk last week. Like most of these things, they’re generally read then discarded; however on this occasion something really stood out. “The top 100 Single Malts yield returns in excess of 66% P/A since 2008 – Source CNN Money 2015”. Wow! No-one told me… How come I missed that? 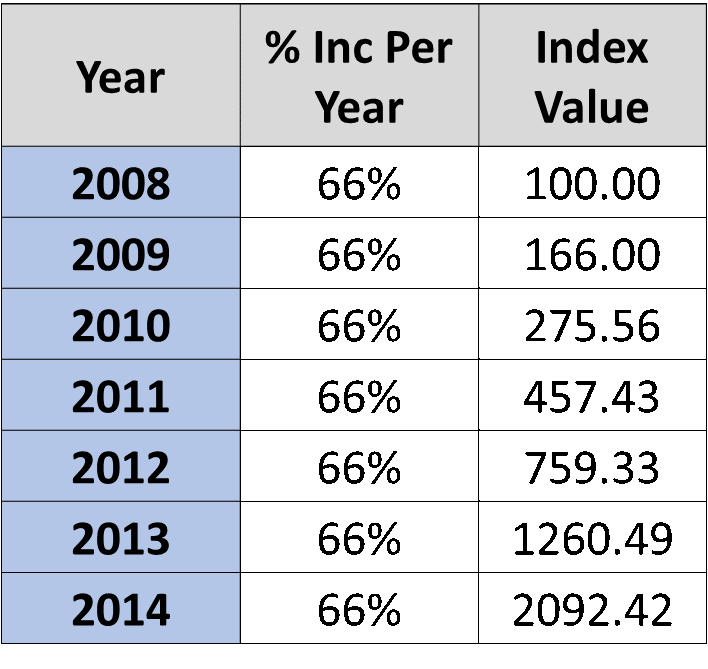 The Apex100 (the top 100 bottles, which you can see here) started at 100 points in 2008 and now stands at 597.26, a 497.26% increase since the end of 2008…. That’s almost a quarter of what’s being advertised here? 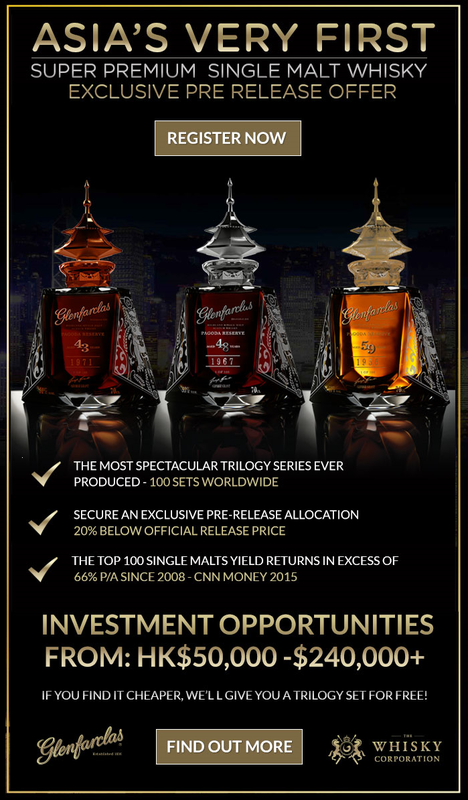 Searching around CNN I found this (http://money.cnn.com/2014/11/20/investing/whiskey-investing/) which I can only assume has been misinterpreted on the Whisky Corporation advert. What CNN actually say is this “Since the first whiskey index was formed six years ago, top single malts have risen in value by more than 660%”. That was factually correct, just at the end of November 2013 and for the top 10 bottles NOT the top 100. At the end of November 2013 the top 100 index was up 374.98%…. not 1,160% as would be the case here if a 66% annual increase were evident. Whisky Highland (the company which grew into RW101) provided insight and information to Global Spirit Merchants (the previous company to The Whisky Corporation) in 2013. That data provision ceased in November 2013… So, being the founder of Whisky Highland, it was easy enough to go back though the records to see what was going on. Was I going mad? Had Whisky Highland provided the wrong information? What was provided was information on the top 10, top 50 and top 100 performing bottles. The top 100 bottles (as at the end of Nov 2013) had increased by 374.98%. That equates to around 30.25% growth year on year to the end of 2013. Less than half what is actually being stated on the above advert. CNN would appear to have been provided with data (not by Whisky Highland or Rare Whisky 101) for the top 10, rather than the top 100, which, at the end of November 2013 had increased by 662.01%. Using incorrect data like this is, in my opinion, exceptionally dangerous. Readers frequently believe whatever’s written, especially if it appears to be endorsed by the likes of CNN. Firstly, without exception, anyone who I’ve ever dealt with who (to a significant level) invests in whisky, or plans to, are intelligent, educated, curious collector-investors. The old adage – a fool and their money are easily parted – couldn’t be further from the truth… anyone who can afford to spend c£10k, £50k, £100k, £250k plus on whisky as an investment/collectable hasn’t made that kind of money by being a fool… nor would they easily give it away. So I find it hard to believe anyone would part with c£20,000 for three bottles of Scotch as an investment based on data which is almost two years out of date? Each index finishes at the end of July 2013. I can only assume these bottles are being specifically sold as an investment as there’s no marketing around the quality of the liquid which you’d assume there would be if these were aimed at drinkers. Each one of the above indices has also had the physical values multiplied by 10. The ‘Signature Portfolio’ (which I named the rather less catchy ‘High Value Bottle Index’) is a collection of 11 of the rarest bottles in existence (including the likes of the Macallan 1928, Balvenie 1937, Ardbeg 1965, Port Ellen Queen’s Visit). The starting value of the bottles was £25,200, not as is incorrectly stated £252,000. The value in July 2013 was £67,460 not £674,600. As a ‘Signature Portfolio’, I’d like to see anyone get hold of ten Macallan 1928’s, ten Balvenie 1937’s and ten Port Ellen Queen’s visit bottles. The same applies to the other indices – For info and accuracy, divide the stated £ amounts by ten and that’s the correct value for each index start/finish. Not because I think there’s anything malicious going on, not because I’m in any way shape or form accusing The Whisky Corporation of anything wrong (everyone makes errors in the rounding), it’s purely to highlight unfortunately not everything reported/advertised is correct. Especially in an unregulated market like whisky where there are many new collectors/investors in the category. Caveat Emptor … Let Buyer Beware!